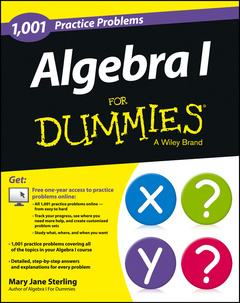 1,001 Algebra I Practice Problems For , Dummies Practice makes perfect—,and helps deepen your understanding of algebra by solving problems 1,001 Algebra I Practice Problems For Dummies , with free access to online practice problems, takes you beyond the instruction and guidance offered in Algebra I For Dummies , giving you 1,001 opportunities to practice solving problems from the major topics in algebra. You start with some basic operations, move on to algebraic properties, polynomials, and quadratic equations, and finish up with graphing. Every practice question includes not only a solution but a step–by–step explanation. From the book, go online and find: One year free subscription to all 1,001 practice problems On–the–go access any way you want it—,from your computer, smart phone, or tablet Multiple choice questions on all you math course topics Personalized reports that track your progress and help show you where you need to study the most Customized practice sets for self–directed study Practice problems categorized as easy, medium, or hard Whether you′re studying algebra at the high school or college level, the practice problems in 1,001 Algebra I Practice Problems For Dummies give you a chance to practice and reinforce the skill s you learn in the classroom and help you refine your understanding of algebra. Note to readers: 1,001 Algebra I Practice Problems For Dummies, , which only includes problems to solve, is a great companion to Algebra I For Dummies, 2nd Edition which offers complete instruction on all topics in a typical Algebra I course.